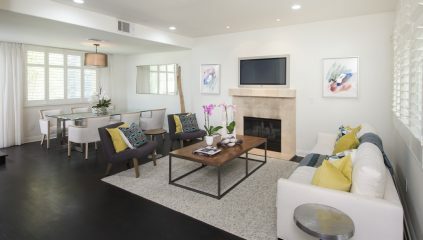 Fabulous Townhouse for your most discriminating Buyers who want the best location and value in Santa Monica! Captivating 2 Bedrooms each with their own enclosed bathrooms and private terraces. Situated in a 5 Unit Complex with only 1 common wall with North and South Views for double light and ocean cross breezes. Hardwood floors, a gas fireplace, plantation shutters, guest powder room, gourmet eat-in Kitchen with a private terrace and stainless steel appliances on main level. Excellent floor plan with direct 2 car side/side private garage, a gym/massage room and wine rack closet located on the lower level. The Master Bedroom has soaring ceilings, huge walk in closet, 2 private terraces, plus a separate tub and shower bathroom with high ceilings & a window. The media room-loft-office makes a great convertible 3rd bedroom with its’ own closets. The show stopper is the rooftop terrace for entertaining, sunbathing, BBQ's & afternoon naps. Moments from famed Montana Avenue, Huckleberry's, Milo & Olive, Santa Monica Seafood, 3rd Street Promenade and 13 blocks to the beach & Pacific Ocean! Surf’s up!